You have done a great job encouraging the Morphew family history. Please keep the effort going. Hopefully, your work will help preserve our family heritage and encourage more amateur family sleuths and writers. I recently retired, am age 62 and in good health. 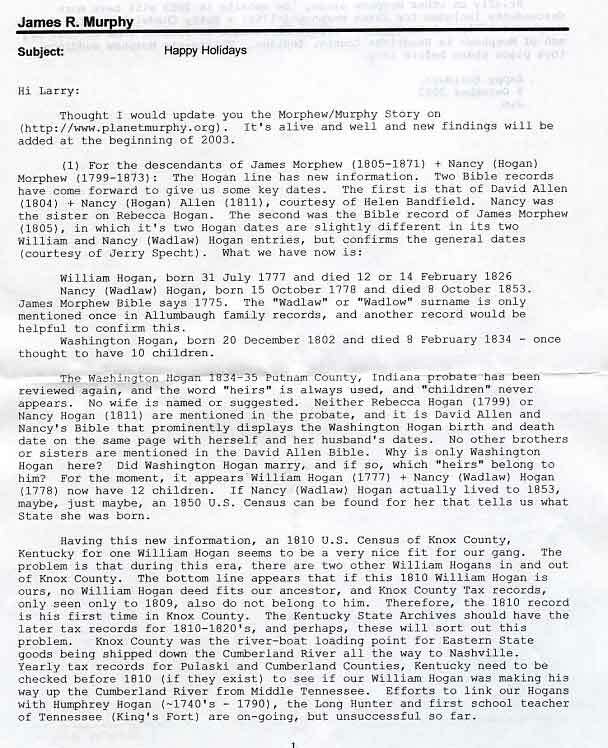 Had to get back into family history with so many accumulated notes and additions that came in over the years (many in unrelated lines) and have begun to put it on my computer in small family packets, so that additions and corrections could be easily made. Somewhere down the line a fully revised 2nd edition will be put on some website. What is really needed, and something I cannot do, is for someone to bring out a new improved Morphew genealogy book, which covers (those of us in) the U.S. and that gang in Canada. Arlie Morphew would want that. Perhaps the use of subeditors (specialists) for such a book could help take off some of the work load from the primary writer. The above linked letter continues on for a paragraph HERE.